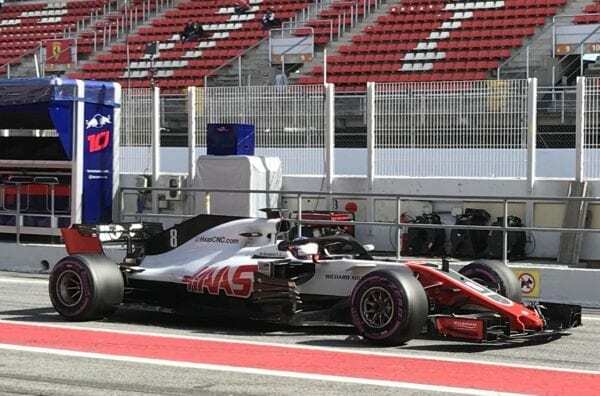 Haas had a promising test in Barcelona, and their drivers are very happy with the step forward. 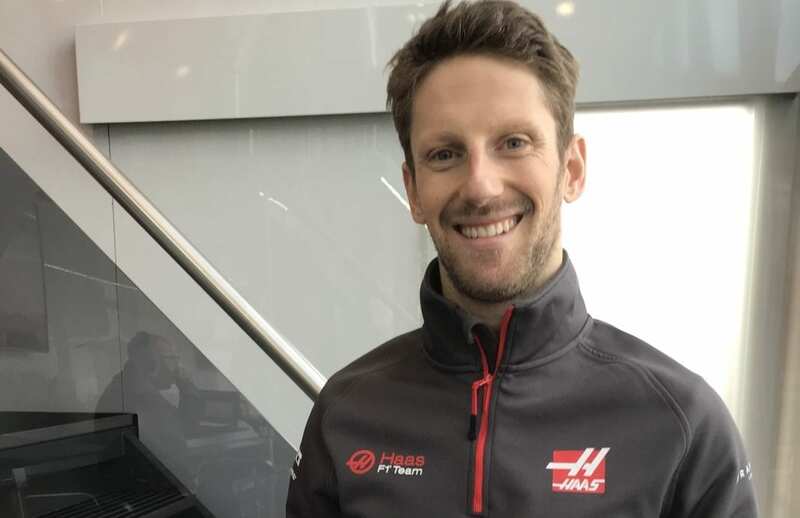 Romain Grosjean can’t wait to get to Melbourne and get a few answers, but before then, Badger’s Sarah Merritt managed to grab him for a quick catch-up covering last season, the great atmosphere within the team, and how excited he is to finally have a home race with the return of the French Grand Prix! Sarah Merritt: How did you spend your winter break? Did you have a nice Christmas dinner with the family? We had few. One with my dad, one with my mum, one with the four of us. We had some good times. SM: It’s your third year at Haas now. It’s good for continuity when drivers stay with a team, and both you and Kevin have. What do you like about being a Haas driver? What keeps you staying here? RG: It’s a great team, there’s a great atmosphere. I feel a part of the team, since day one, so it’s special to be here and I really enjoy it. It’s a team that is building and I want to make it successful. That’s why I joined initially, to build the team and try to bring it as high as we could on the standings. So, I’m looking forward to seeing what we can do this year, and get a few answers in Melbourne. SM: They seem like a nice bunch of people. Is that what it’s like working in the team, it’s very close? RG: Yes, we are a fairly small team and everyone gets on very well with each other and we’ve got a great relationship. Gene is a big part of that. We have fun. SM: I often see you tweeting your mechanics and things like that. I think it shows there’s a good rapport with the team. So, sum up last year for me; what did 2017 look like for you? RG: Well, it started well and then it became more difficult. We knew the second year in Formula 1 was always going to be a challenge, so we tried as hard as we could. Some good things and some consistency in the first part was good, and then the second part of the season got a bit harder. Hopefully, that’s not going to be the case this year. SM: I hope not! I wanted to ask you about radio messages. It’s something I’ve heard other drivers talk about in the past that, that on the live-feed, they pick the messages that they play and sometimes that’s done in a way that makes things look different than how they are in reality. SM: I know last year they played a lot of yours when you were talking about your brakes. What do you think about that? Do you ever get feedback on that kind of thing? Do you think it’s a bit naughty that they do things like that? RG: Well, they are trying to make F1 interesting for fans. On a football pitch, you don’t have any radios or microphones – it would be pretty interesting to see what’s been said. We know it’s there and I just think that the radio message, that’s for the team and then if they want to broadcast them, they do. To me, the most important thing is that its communication with the team and I can tell you there’s a lot of swearing and a lot of different things! SM: What were your first impressions on the VF18, having driven it at testing? RG: Good. Very good. Very happy with the car. SM: You think it’s a step forward? SM: That’s good. I know there’s been input into this years’ car design from both you and Kevin. Do you think a compromise has been reached on both of your driving styles, to make it good for both of you? RG: I think so. We were asking for different things, but at the end, we are asking the same things. So, it wasn’t very complicated – we knew what we wanted and it was well translated in the engineering department to produce what we wanted. 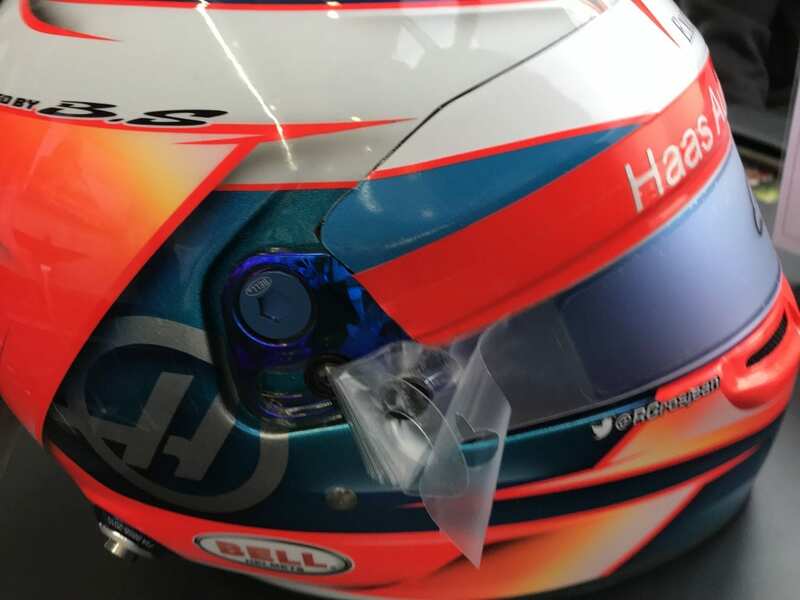 SM: What are your thoughts on the Halo, now you’ve driven the car with it? RG: Well, you can forget it. You’re driving with it, and for sure the visibility is less good than what it was, there is no question, but when you’re driving, you kind of forget it. Driving in the middle of other cars is going to be a question mark. We don’t know yet about that. Jumping in and out of the car is much harder, but once you’re in, so far it’s been good. Maybe corners like Eau Rouge at Spa–Francorchamps could be difficult because you need to look up and we can’t, but we’ll find out. SM: I guess for the teams that used to put their monitors on the car in the garage. You can’t do that anymore. RG: I’ve got double monitors now; one on each side. They find the problem. They solve it. SM: There are three French drivers in F1 now, and you’ve got a home race on the calendar this year. What are your thoughts on that? Are you looking forward to it? RG: It’s special because I’ve been Formula 1 for like seven seasons and I’ve never had a home race, and finally, I’ve got the French Grand Prix coming and of course, I am super excited to have it. I am very much looking forward to driving there in front of our fans, and to hear La Marseillaise before the start and just see what’s it’s like! SM: Do you think the boost of a home crowd can be like they speak about in football, having the 12th person playing on the pitch. Do you think it will give you a boost? RG: Maybe, we will see. I’ll find out! SM: I wanted to ask you about your cookbook. How did that come about that you did that? How do you get any time? RG: I’ve passionate about cooking since 2009-10. I didn’t have kids at that time, and I’ve always loved cooking and I met a lot of chefs. Eventually, I met Patrick Rougereau, the photographer, and he’s done a lot of cookbooks with a lot of chefs, and he’s passionate about racing. He said “well you know I have an idea, we could do something nice”, and I said, “yes, okay let’s do it”. I think it’s a good project, I think we’re going to have fun, and let’s see what it brings us. SM: It feels very personal when you put it like that. What is your favourite thing to eat? Would it be one of your recipes in this book or at times, would you rather go and have, say, a burger? RG: No, I’m French so a bit more…a good burger is really good, but, it’s not as good as a top-end French dish. SM: What would be your favourite dish, if you could go out tonight and eat anything? RG: I’d pretty much eat everything. I love everything, which is a bit of a problem. SM: Oh, you’ve got to train more for that! I know family is very important to you and I often see that you have Sasha’s drawings in the car. How did that come about? Is it something he asked you to do? RG: No, it was the mechanics. I think last year he drew something and I asked him “can I carry it with me to Singapore?” and he said yes, so I brought it and I told him I’m going to take a picture with it because he misses me when I am away. So, I took a picture in the city, in front of the car, in the garage with the mechanics. The mechanics saw it, so they took a picture of it and they taped it in the car. The same thing happened this year. He asked me “Daddy, can you design a Formula 1 car?” so I drew a small Formula 1 car. He came back 10 minutes later to me, and he had done a Formula 1 car. I was very surprised at how good it was, so I treated him because I was super proud of him drawing a Formula 1 car and knowing what Daddy is doing, and so on. SM: It’s great because even when you’re away, you have this way of keeping in touch. RG: It’s difficult for them, because we are away quite a lot and they’re young and they need their dad, but on the other hand, they know I need racing to be the dad I am, and then when I’m home, I’m home, so at the end, it’s not a bad deal. SM: What goals have you set yourself for the year ahead? RG: Depends on the car. SM: Are you hard on yourself? RG: Yes, pretty hard. I always want to get better and do better. We’ll see where the car is, but I want to try to get every opportunity out of it and just do the best I can. SM: So lastly, I wanted to ask you about your helmet design for 2018. I know it is an evolution of your previous one, but how it came about? You have your Jules Bianchi sticker on there as always. 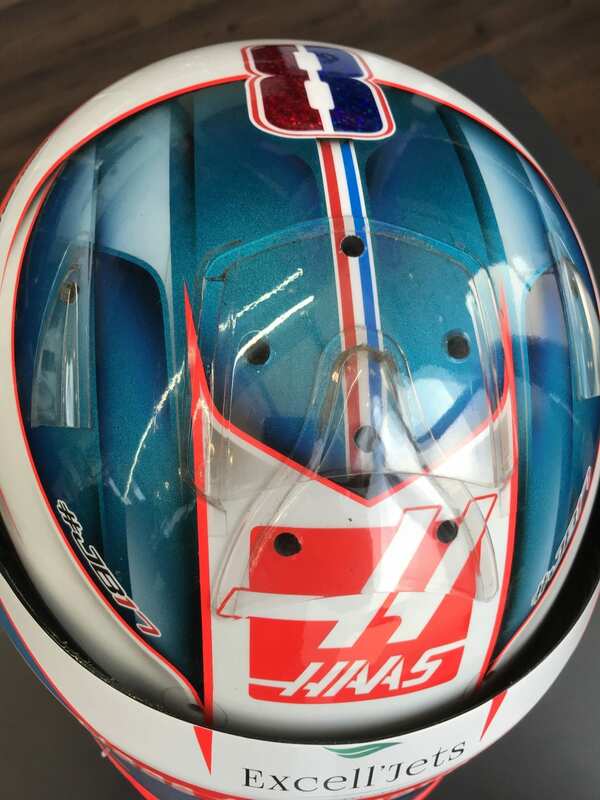 RG: They are colours that I always wanted to have on my helmet. Blue, orange, yellow initially. They were the colours that I was wearing on my first ever helmet. They have almost always followed me. At least one of them was on the helmet all the time. Last year, my designer produced the one that was before this, which I really loved, and we discussed over Christmas and we tried different options to see if we could do something better and we didn’t really get anywhere. We changed a few things and it’s a bit different on the front, lighter on the side. For Melbourne, the orange is going to be light blue, so some small changes. I love the helmet, so it is going to be difficult to change, and I’ve got an identity that I feel good about. Maybe I will change it in a couple of years or so, but right now I’m super happy with that design. For the French Grand Prix, there’s going to be something special. 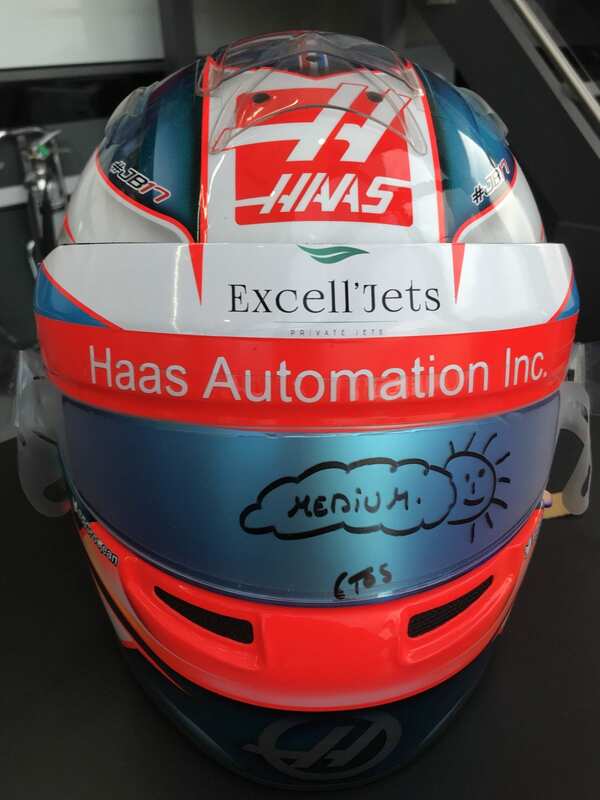 Many thanks to Romain and the Haas team for their time. Next article2018 F1 Season Preview: Who is facing a make or break season?